It’s a self-tanner using black tea. Should work, right? I mean, it stains your teeth, so why not your legs? I steeped myself some tea and set out to test it. I opted for the sponge method rather than the spray bottle method, mostly because I don’t trust my aim with a spray bottle and I didn’t want my walls to have a fake tan, too. Can you tell which one I tanned? Yeah, me either, although when I asked my husband when he got home, he pointed to the right one, which was correct. I guess he had a 50/50 chance. So yeah, my right leg should be slightly less pale than my left leg. You be the judge. It definitely got tanner than my legs did. Sooo, if you’re looking for a self-tanner solution, you should probably just go buy some. 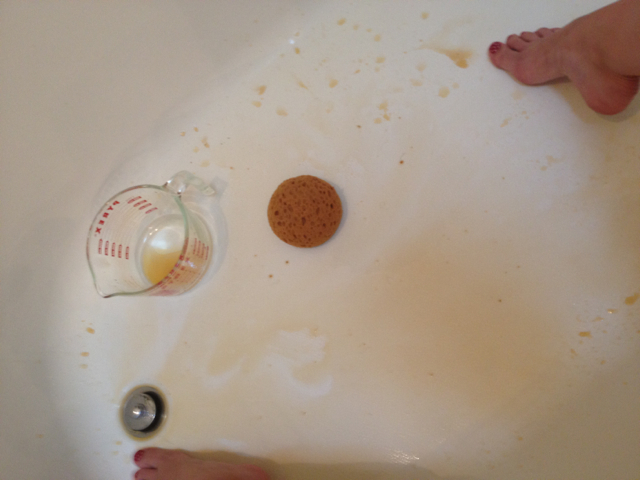 I would much rather have had this tea to drink than sponge it all over one leg for a tan you can’t really tell is there. I tried this once…. many moons ago when I was an insecure highschool girl. Except I thought I could Steep the bags in the tub and just sit in the tea…… The end was not pretty, and I owed my mom a new box of tea. I said right leg too! 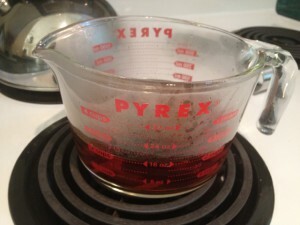 Doesn’t Pyrex explode if you heat it on the stove!?! Be careful! Lol your legs look super skinny! I tried this one and it worked until I took a shower, but I smelled like tea until I took a shower. I used a spray bottle to apply. I would spay my legs then use a hairdryer to dry the tea spray faster. I did 3 coats and it looked okay where it didn’t run. You looked tanned to begin with. You said you were ghostly pale, so at first I thought those were your after pics. I cant tell the difference between the left and right leg but I would say they both looked tanned to begin with. On someone with genuinely white legs, it might work. You could try coffee instead. But your legs are a nice colour already. I actually tried this one and it really does work. Maybe mine worked because I sprayed it on and then patted it with a sponge to catch drips! I also let the tea bags soak longer than directed!